As a parent you do all you can do for your kids, give them everything they need and care about them more than you ever thought possible. Did you ever wonder if you should expect anything in return? Parenting isn’t easy; we all know that. We get pooped on, spit up on and agree to live sleep deprived indefinitely. Strangers feel free to judge us and offer their unsolicited advice, allowing us to bask in the glow of their undoubtedly superior intelligence. When our kids excel, we are the first to give them credit, but when they struggle, we are clearly the ones to blame. That’s the way it is; parenting is simple, but not easy. The simple fact is that this was never designed to be a fair relationship. They can keep us up at night, but we don’t wake them. They will need us for everything from basic needs like food and shelter, to helping them reach for their dreams, but we will spend our lives never wanting to be a burden to them. Willingness to make sacrifices for our children is the hallmark of parents everywhere. Many of us spend whole lifetimes reminding our kids that we love them, no matter what. Unconditional love colors every moment of parenting, not because we will be given anything in return, but simply because we love our kids unconditionally. Still, are parents entitled to anything in return? We hope for love, but that cannot be demanded. Love, by definition is only love when it is freely given. So what can parents require from children? 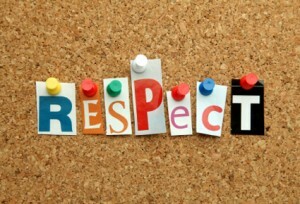 One thing; respect. Parents try and teach their kids about self-respect, but we don’t always do a good job modeling what that looks like. In our efforts to empower our kids, it seems like sometimes we diminish ourselves. Diminishing is not sacrificing. Sacrificing is denying ourselves to benefit our children, diminishing is choosing to be in servitude to a tyrant. There is nothing better than sharing your life with children who understand that everyone is on the team and we need to respect each other. Gratitude and teamwork make a family strong, not narcissists who feel entitled to be on top even if it means standing on another person’s neck to get there. Any lesson coming from a loving parent is always preferable to the same lesson delivered by the school of hard-knocks. We all want to indulge our kids and there is nothing as fun as saying yes, but the minute that yes is met with and what else? We need to reevaluate. Commanding respect is a good thing and a necessary thing. Teaching kids to challenge authority is useful only when you teach them how and when to do it. Challenging authority with respect gets you heard, yelling at the principal gets you suspended. As parents we deserve respect. We deserve gratitude. Good parents have earned both every day. Teaching our kids to speak to us with respect, to be grateful for our sacrifices and to exchange entitled for empowered will give them the perspective they will need as they start out on their own life journey. I believe if we want to build a more compassionate community we need to build the foundation by respecting the parents in our home. We talk a lot about bullying among children. In the classroom, the locker room, on school buses or online, but we are usually talking about kids. The reasons to end bullying are endless, but almost exclusively tied to making childhood a better and safer place, but there is more to it than that. I believe bullying is best prevented in our pre-schools, but when it happens, it must be stopped not just for peace today, but also for safety in the future. A playground bully who is never challenged, stopped and taught to change his or her ways will abide by a fundamental law of physics. A body in motion will stay in motion. That kid on the playground that bullies another and makes a sport out of demeaning someone as a means to gain status, has learned a useful, if dangerous, technique. Bullies on the playground will keep going unless someone steps in. No matter how much kindness or patience is shown to bullies, they don’t typically come to an epiphany on their own. They don’t often simply decide to turn over a new leaf and make a change from coercion to cooperation. Bullies keep bullying until some outside force stops them. That force may be a community response, a skilled teacher, or even the police, but bullying keeps going as long as it is effective in delivering more feelings of power, status or self-righteousness to the bully. Why does this matter to you? Even if you don’t have kids or feel personally affected by bullying, you are right in the middle of this nation-wide mess. Bullies grow up. They become doctors who discount what you tell them, lawyers who push around weaker opponents; teachers who can’t recognize the bullies in their own classrooms, or some even become professional athletes or politicians. Bullies like power and status and they often believe the end justifies the means as long as in the end, their needs are satisfied. Ending bullying isn’t just a great idea for a children’s special, or a movement among parents who want fairness to rule the day. Ending bullying can become a matter of national import when bullies are in positions of trust. Bullies may begin as preschoolers who are never taught that empathy matters, but if it festers, it can lead all the way to global crisis or even war. Parents sometimes feel like the job they do is at once fundamentally important, but still somehow less respected or vital than the careers they might pursue. Perhaps changing the world, or as Steve Jobs liked to call it, putting a “ding in the universe,” doesn’t happen at work as adults. Maybe the biggest ding we can make is understanding that there is no job as important to the world as being good parents. No job as influential as teaching empathy. Not just for the benefit of today’s children, but for the survival of tomorrow’s world. 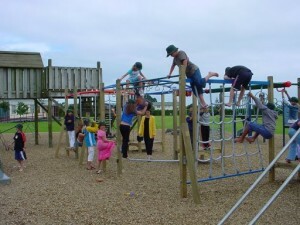 The playground is a wonderful place where kids laugh, have fun and stay totally unplugged. It’s fun for parents too. It’s like group therapy on the benches punctuated by providing snacks and wiping noses as needed. Talking with other moms and dads while our kids play is a guilt free way to have a little grown up time in the midst of a busy day. I’ve learned a lot during my playground visits. I’ve learned that running up a slide is a bad idea (because emergency rooms are no fun,) I’ve learned that I cannot play tag in heels, (same reason) and I learned that kids aren’t the only ones making great friends. Lately I’ve been seeing some amazing new developments and I was wondering if you noticed the same trends at your playground. For years our playground has been a hotbed of what I call Concierge Parenting. These are the parents who long to fulfill each and every desire of their offspring, immediately. You want a new ball because yours is pink and her red one is better? Sure. You want a Baby Grand because you have taken two piano lessons? Absolutely, I completely encourage your passions. I’d like to say all this pleasing and satisfying has produced gratitude, kindness and joy, but my mom told me never to tell a lie. The results I’ve seen are insecurity, rudeness and a sense of entitlement second to none. And even worse for parents who over time have become helpless. Lately though, I’ve witnessed a new approach at the playground. The Concierge style seems to be giving way to what I call Empowerment Parenting. We seem to have embraced Dr. Seuss’ wisdom and are teaching our kids to smile because it happened, rather than cry because it’s over. You like her red one? Me too, let’s share our toys so we all have even more fun. I am so happy you like piano lessons. Maybe you can play Happy Birthday for Grandpa. Parents are empowering and redirecting their kids from a feeling of lack, to a sense of security. And since this shift, gratitude is replacing attitude and joy and kindness now make regular appearances on the playground. I have been an advocate for Empowerment Parenting for years and it’s so exciting to see it in action. What about you? Is it catching on in your neighborhood too? 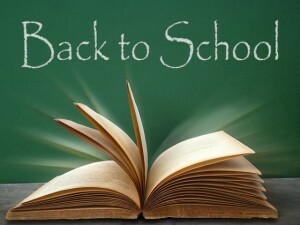 It’s natural for everyone to feel a little anxious about returning to school after a summer of free time and relaxing. It’s hard to make the move to living more and more inside and the challenges of school, homework, sports and music. Add to that any hope of precious free time to just play and it can be a tall order for sure, but not impossible. Take a deep breath and plan, that’s what works for us. The single most important thing to do BEFORE school gets crazy is to prioritize. My list looks something like this. 1. Family, 2. School, 3. Play, 4. Sports, 5. Music. Even looking at my list makes my pulse quicken just a little. How will it work this year? Weekend games or games an hour away on a school night can be a real threat to family dinners. Teaching my kids that unstructured time to play and laugh and just breathe is important and should be prioritized, can be a struggle. In a world that is all about shuttling our kids from this to that and back again, it’s not always easy to be the lone voice in the wilderness saying let’s build a fort on a Tuesday afternoon. Kids buy into the constant messaging all around them and feel like a day without an appointment is odd. Still, I believe in play and I believe in family play, so it’s on my list. School is the easy one. No doubt we will all get to school and do our best. My kids set up around the kitchen table for homework. All four of them stake out a space and everyone has areas of expertise if a sibling needs some help. It means so much to me to see them working side-by-side and helping when needed. It’s a great review for some and a treat for others to help out the older ones by sharpening a pencil or getting the calculator. The homework table is an experiment in teamwork five nights a week. Sports and music are important too. Our rule of thumb is one after school activity that is physical, (lets you work up a good sweat) and one that is for self-expression, (music is a great artistic outlet and painting is great too.) Playing on a team does more for self-confidence and self control than almost anything else and it is another way to build the family team by cheering each other on. Artistic expression helps a child channel their emotions into beauty and that is a life skill for coping with challenges at any age. So now you have it, my list and my priorities for my family. Yours may be different because your family is different. This is a personal process, but what really matters is that we take the time to think about it. What does a great school year look like for you? Set your goals and you can reach them. Enjoy your family and don’t be afraid to follow your instincts. It happens to all of us and the good news is that we all get through it, but being the new kid can still make you fell like a long-tailed cat in a room full of rocking chairs. Whether your child is entering pre-school, just moving in, or preparing for the unmitigated joy that is Middle School, being the new kid can be a scary experience. Then there is the special joy of being new to a school in a grade where you think everyone else is already settled. Transfers from across town or even another country face a special set of worries from meeting new people, meeting new expectations and wait for it… You guessed it… finding the bathroom. We want our kids to be happy and successful in school and for them to feel secure enough to try new things and even learn something, so how can we help? It sounds like a daunting task when you think about all the variables you cannot affect. So many unknowns from new teachers, new peers and new communities, but you are not without choices. We can choose to help our kids get comfortable with our new school in lots of ways. Here are some tips that have worked for me. Don’t be a stranger. Visit the new school often before school even starts. Take your little one to the playground, take a walk around campus and even try to meet some other students before the first day. Lots of schools host Welcome Back events where young children can meet their teacher, classmates and even see the classroom. If your school offers this chance, take it. It is a great way to lesson the anxiety by getting more familiar with the school. Feel free to reach out to other parents too. If your child is starting a big entry year, (read Kindergarten, Middle or High School), you are not the only one who is new. Reach out to each other and you will soon have a buddy for yourself as well as showing your little one how to make friends. Talk about it. It’s easy to imagine what your child might be concerned about, but unless you’re a mind reader, (and if you are, could you come with me to my next pitch meeting? ), you can never know for sure what your child is thinking. Try not to project what you are worried about, rather, ask open-ended questions and listen to your child actual concerns. Maybe he isn’t worried about meeting new people, maybe it’s being sick on the school bus that has him worried. Ask the questions and listen for the answers, they might just surprise you. Embrace your inner Spin Doctor. This is about good old-fashioned marketing. Talk up the good points of the school and the fun of trying something new. Chances are your Kindergartener has no idea she should be nervous, enjoy the joy of unblemished potential. You chose this school for your child. You have good instincts, trust yourself enough to know you made a good choice. Share with your child how much fun the playground is at school, how friendly the teacher will be and most of all how happy you are that your child gets to go to such a great place. All of this will help maintain a positive attitude of gratitude and that goes a long way toward a great year. Be a good guest. Remind your child that, at least in the beginning, the best approach is to be a good guest. Your new school is, by definition, not your old school. They will do things differently. That is okay. No one likes to feel judged so try to keep an open mind about things in your new school that you didn’t expect. Better to say, “I’ve never seen it done that way…” than to preach about how much more efficiently your old school handled it. You are a new member of a community that will have a big impact on your whole family. Get to know them with an opened mind and a closed mouth when it comes to the way they do things. Every school is different and most of them know what they are doing pretty well. If you picked well, then you can afford to give them the benefit of the doubt and give yourself a break. I guess that is the bottom line of any advice I ever give, trust yourself. You are a good parent, not a perfect person, but a good parent. You love your child and so chances are you will make good choices and have good instincts. Trust your instincts.